The global operating room management market is witnessing a sustained growth all over the world. This is due to the fact that hospitals presently are focussing on cost control, improving the efficiency of operating rooms and also in order to improve the infrastructure in the operating rooms. In addition to this, the macroeconomic factors that are at play in driving the global operating room management market are the increasing incidences of diseases and an increasing geriatric population. Moreover, due to rising technological innovation, there is an increase in the demand for operating room supply management software. The operating room management facilitates enhanced coordination and communication between different surgical teams. Care is taken to use best ergonomics, effective monitoring and detailed control of operating room systems in order to perform surgeries in a faster manner and with more safety and efficiency. Due to the excellent facilities provided in such kind of operating rooms, it attracts more number of patients and better doctors to the hospitals which consequently improves the revenues of the hospitals. According to the assessment of Transparency Market Research, the global operating room management market is forecasted to reach a figure of about US$ 3,600 Mn in 2022 and is poised to exhibit a robust CAGR in the period of assessment. The market in North America is set to dominate the global operating room management market in terms of value and this trend is projected to sustain itself throughout the assessment period. North America operating room management market is the most attractive market, growing at a robust CAGR over the forecast period. According to the projections of Transparency Market Research, the solutions segment is expected to reach a value of about US$ 925 Mn in the year 2022. This signifies a robust CAGR during the forecast period of 2017-2022. The solutions segment is estimated to account for more than one-fourth of the revenue share of the component segment by the end of the year 2017 and is expected to lose in market share by 2022 over 2017. According to the assessment of Transparency Market Research, the data management and communication solutions segment is poised to touch a figure of about US$ 1,300 Mn in the year 2022. This signifies a CAGR of more than 11% during the assessment period from 2017 till the year 2022. The data management and communication solutions segment is estimated to account for more than one-third of the revenue share of the application type segment by the end of the year 2017 and is projected to lose market share by 2022 over 2017. The report also profiles companies that are expected to remain active in the expansion of global operating room management market through 2022, which include Becton, Dickinson and Company, Omnicell, Inc., Allscripts Healthcare Solutions, Inc., Getinge AB, Richard Wolf GmbH, Cerner Corp., Steris PLC, Nexus AG, General Electric Company, Optum Inc. and McKesson Corp. The global operating room management market report describes this lucrative healthcare IT market in great detail. The historical growth trajectory of the operating room management market has been going northwards, owing to a number of key economic factors. The future of the operating room management market thus represents significant investment for many major players in the market. The historical information about the 2012-2017 growth of the segments of the global operating room management market is used to establish a solid foundation for forecasts regarding the operating room management market’s growth potential in the coming years. The predictions are backed by the use of industry-standard analytical models and data gathered from primary and secondary sources. The report thus becomes a valuable asset for any player attempting to expand their presence in the global operating room management market in the years to come. 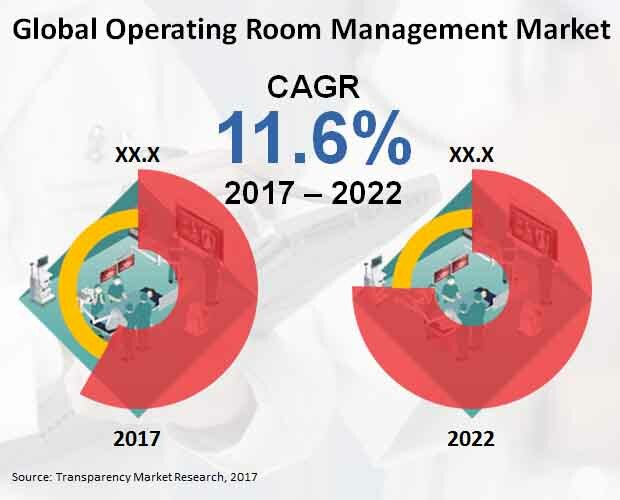 According to Transparency Market Research, the global operating room management market is likely to be valued at US$ 3,600 Mn by the end of the year 2022, exhibiting a robust CAGR during the assessment period. Due to the cutting edge innovations in the realm of healthcare IT, there has been a strong demand for operating room management systems in the various hospitals all over the world. The healthcare sector is focusing on improving their services and efficiency and operations, and at the same time decrease the cost incurred on such activities. In order to achieve this, hospitals are focusing on providing state of the art operating rooms, which have all the latest facilities and enable better coordination and communication between different teams of surgeons and the support staff. Also, with such high-end technology, the number of operations that can be performed in a single operating room increases, also increasing the safety and efficacy of the operations performed. This attracts more number of patients to such hospitals where such kind of advanced operating rooms are available, thereby increasing the revenues of such hospitals. The leading segments of the global operating room management market are profiled in the report to provide readers with a clear idea of the competitive hierarchy of each section of the market. This detailed information about the hierarchy of the operating room management market provides readers with a clear picture of the granular dynamics of the market and the potential of various parts of the market. The report segments the global operating room management market by component, application and delivery mode to provide a comprehensive look into the market. The geographical segmentation of the global operating room management market is also elaborated upon in the report. Geographically, North America is likely to remain the dominant contributor to the global operating room management market, while services segment will remain the largest in component type. The leading application segments of the global operating room management market include Data Management and Communication Solutions, Anesthesia Information Management Systems and Operating Room Supply Management Solutions among others. The report assesses the various factors affecting the competitive dynamics of the global operating room management market in the coming years. The leading players operating in the operating room management market are profiled in the report, including information such as the product development strategies developed by the companies and their geographical presence. Leading operating room management market players profiled in the report include Allscripts Healthcare Solutions, Inc., Becton, Dickinson and Company, Cerner Corp., General Electric Company, Getinge AB, McKesson Corp., Optum Inc., Richard Wolf GmbH, Steris PLC, Nexus AG and Omnicell, Inc.